Sahih International Those messengers - some of them We caused to exceed others. Among them were those to whom Allah spoke, and He raised some of them in degree. And We gave Jesus, the Son of Mary, clear proofs, and We supported him with the Pure Spirit. If Allah had willed, those [generations] succeeding them would not have fought each other after the clear proofs had come to them. But they differed, and some of them believed and some of them disbelieved. And if Allah had willed, they would not have fought each other, but Allah does what He intends. Sahih International O you who have believed, spend from that which We have provided for you before there comes a Day in which there is no exchange and no friendship and no intercession. And the disbelievers - they are the wrongdoers. Sahih International Allah - there is no deity except Him, the Ever-Living, the Sustainer of [all] existence. Neither drowsiness overtakes Him nor sleep. To Him belongs whatever is in the heavens and whatever is on the earth. Who is it that can intercede with Him except by His permission? He knows what is [presently] before them and what will be after them, and they encompass not a thing of His knowledge except for what He wills. His Kursi extends over the heavens and the earth, and their preservation tires Him not. And He is the Most High, the Most Great. Sahih International There shall be no compulsion in [acceptance of] the religion. The right course has become clear from the wrong. So whoever disbelieves in Taghut and believes in Allah has grasped the most trustworthy handhold with no break in it. And Allah is Hearing and Knowing. Sahih International Allah is the ally of those who believe. He brings them out from darknesses into the light. And those who disbelieve - their allies are Taghut. They take them out of the light into darknesses. Those are the companions of the Fire; they will abide eternally therein. Sahih International Have you not considered the one who argued with Abraham about his Lord [merely] because Allah had given him kingship? When Abraham said, "My Lord is the one who gives life and causes death," he said, "I give life and cause death." Abraham said, "Indeed, Allah brings up the sun from the east, so bring it up from the west." So the disbeliever was overwhelmed [by astonishment], and Allah does not guide the wrongdoing people. 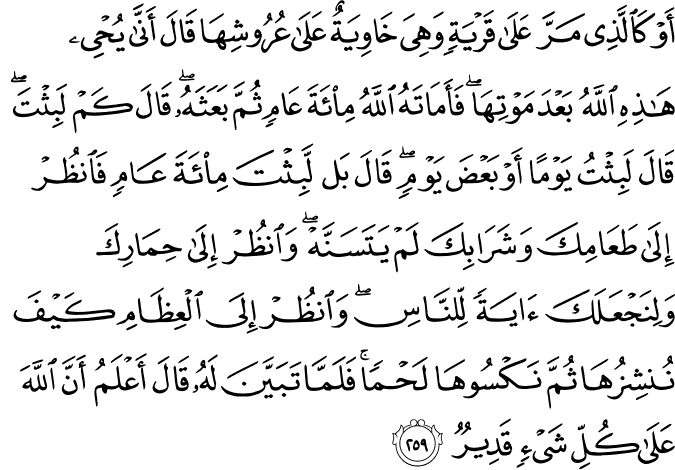 Sahih International Or [consider such an example] as the one who passed by a township which had fallen into ruin. He said, "How will Allah bring this to life after its death?" So Allah caused him to die for a hundred years; then He revived him. He said, "How long have you remained?" The man said, "I have remained a day or part of a day." He said, "Rather, you have remained one hundred years. Look at your food and your drink; it has not changed with time. And look at your donkey; and We will make you a sign for the people. And look at the bones [of this donkey] - how We raise them and then We cover them with flesh." And when it became clear to him, he said, "I know that Allah is over all things competent." Sahih International And [mention] when Abraham said, "My Lord, show me how You give life to the dead." [ Allah ] said, "Have you not believed?" He said, "Yes, but [I ask] only that my heart may be satisfied." [ Allah ] said, "Take four birds and commit them to yourself. Then [after slaughtering them] put on each hill a portion of them; then call them - they will come [flying] to you in haste. And know that Allah is Exalted in Might and Wise." Sahih International The example of those who spend their wealth in the way of Allah is like a seed [of grain] which grows seven spikes; in each spike is a hundred grains. And Allah multiplies [His reward] for whom He wills. And Allah is all-Encompassing and Knowing. Sahih International Those who spend their wealth in the way of Allah and then do not follow up what they have spent with reminders [of it] or [other] injury will have their reward with their Lord, and there will be no fear concerning them, nor will they grieve. Sahih International Kind speech and forgiveness are better than charity followed by injury. And Allah is Free of need and Forbearing. Sahih International O you who have believed, do not invalidate your charities with reminders or injury as does one who spends his wealth [only] to be seen by the people and does not believe in Allah and the Last Day. His example is like that of a [large] smooth stone upon which is dust and is hit by a downpour that leaves it bare. They are unable [to keep] anything of what they have earned. And Allah does not guide the disbelieving people. Sahih International And the example of those who spend their wealth seeking means to the approval of Allah and assuring [reward for] themselves is like a garden on high ground which is hit by a downpour - so it yields its fruits in double. And [even] if it is not hit by a downpour, then a drizzle [is sufficient]. And Allah , of what you do, is Seeing. Sahih International Would one of you like to have a garden of palm trees and grapevines underneath which rivers flow in which he has from every fruit? But he is afflicted with old age and has weak offspring, and it is hit by a whirlwind containing fire and is burned. Thus does Allah make clear to you [His] verses that you might give thought. Sahih International O you who have believed, spend from the good things which you have earned and from that which We have produced for you from the earth. And do not aim toward the defective therefrom, spending [from that] while you would not take it [yourself] except with closed eyes. And know that Allah is Free of need and Praiseworthy. Sahih International Satan threatens you with poverty and orders you to immorality, while Allah promises you forgiveness from Him and bounty. And Allah is all-Encompassing and Knowing. Sahih International He gives wisdom to whom He wills, and whoever has been given wisdom has certainly been given much good. And none will remember except those of understanding. Sahih International And whatever you spend of expenditures or make of vows - indeed, Allah knows of it. And for the wrongdoers there are no helpers. Sahih International If you disclose your charitable expenditures, they are good; but if you conceal them and give them to the poor, it is better for you, and He will remove from you some of your misdeeds [thereby]. And Allah , with what you do, is [fully] Acquainted. Sahih International Not upon you, [O Muhammad], is [responsibility for] their guidance, but Allah guides whom He wills. 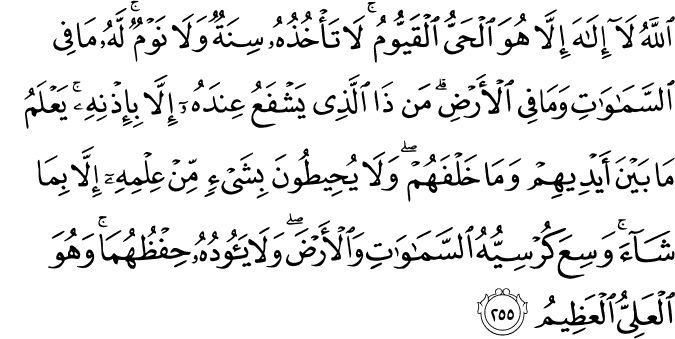 And whatever good you [believers] spend is for yourselves, and you do not spend except seeking the countenance of Allah . And whatever you spend of good - it will be fully repaid to you, and you will not be wronged. Sahih International [Charity is] for the poor who have been restricted for the cause of Allah , unable to move about in the land. An ignorant [person] would think them self-sufficient because of their restraint, but you will know them by their [characteristic] sign. They do not ask people persistently [or at all]. And whatever you spend of good - indeed, Allah is Knowing of it. Sahih International Those who spend their wealth [in Allah 's way] by night and by day, secretly and publicly - they will have their reward with their Lord. And no fear will there be concerning them, nor will they grieve. Sahih International Those who consume interest cannot stand [on the Day of Resurrection] except as one stands who is being beaten by Satan into insanity. That is because they say, "Trade is [just] like interest." But Allah has permitted trade and has forbidden interest. So whoever has received an admonition from his Lord and desists may have what is past, and his affair rests with Allah . But whoever returns to [dealing in interest or usury] - those are the companions of the Fire; they will abide eternally therein. Sahih International Allah destroys interest and gives increase for charities. And Allah does not like every sinning disbeliever. Sahih International Indeed, those who believe and do righteous deeds and establish prayer and give zakah will have their reward with their Lord, and there will be no fear concerning them, nor will they grieve. Sahih International O you who have believed, fear Allah and give up what remains [due to you] of interest, if you should be believers. Sahih International And if you do not, then be informed of a war [against you] from Allah and His Messenger. But if you repent, you may have your principal - [thus] you do no wrong, nor are you wronged. Sahih International And if someone is in hardship, then [let there be] postponement until [a time of] ease. But if you give [from your right as] charity, then it is better for you, if you only knew. Sahih International And fear a Day when you will be returned to Allah . Then every soul will be compensated for what it earned, and they will not be treated unjustly. Sahih International O you who have believed, when you contract a debt for a specified term, write it down. And let a scribe write [it] between you in justice. Let no scribe refuse to write as Allah has taught him. So let him write and let the one who has the obligation dictate. And let him fear Allah , his Lord, and not leave anything out of it. But if the one who has the obligation is of limited understanding or weak or unable to dictate himself, then let his guardian dictate in justice. And bring to witness two witnesses from among your men. And if there are not two men [available], then a man and two women from those whom you accept as witnesses - so that if one of the women errs, then the other can remind her. And let not the witnesses refuse when they are called upon. And do not be [too] weary to write it, whether it is small or large, for its [specified] term. That is more just in the sight of Allah and stronger as evidence and more likely to prevent doubt between you, except when it is an immediate transaction which you conduct among yourselves. For [then] there is no blame upon you if you do not write it. And take witnesses when you conclude a contract. Let no scribe be harmed or any witness. For if you do so, indeed, it is [grave] disobedience in you. And fear Allah . And Allah teaches you. And Allah is Knowing of all things. Sahih International And if you are on a journey and cannot find a scribe, then a security deposit [should be] taken. And if one of you entrusts another, then let him who is entrusted discharge his trust [faithfully] and let him fear Allah , his Lord. And do not conceal testimony, for whoever conceals it - his heart is indeed sinful, and Allah is Knowing of what you do. Sahih International To Allah belongs whatever is in the heavens and whatever is in the earth. Whether you show what is within yourselves or conceal it, Allah will bring you to account for it. Then He will forgive whom He wills and punish whom He wills, and Allah is over all things competent. 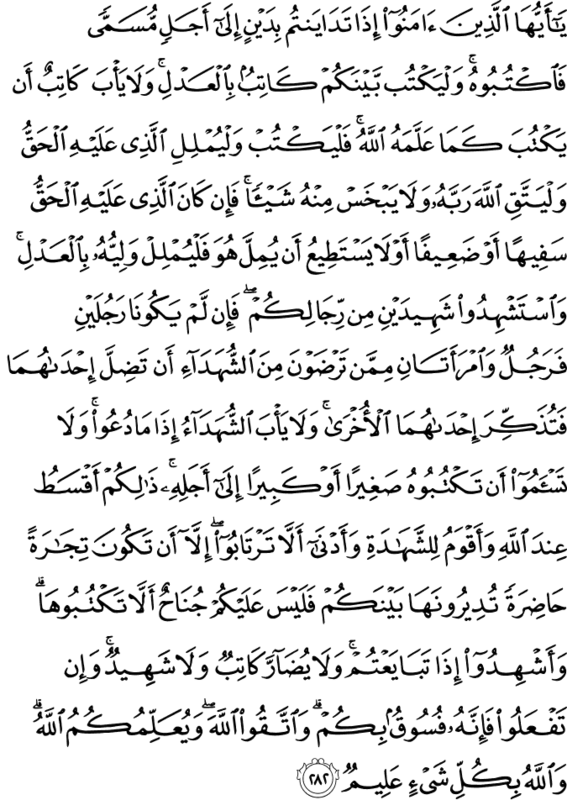 Sahih International The Messenger has believed in what was revealed to him from his Lord, and [so have] the believers. All of them have believed in Allah and His angels and His books and His messengers, [saying], "We make no distinction between any of His messengers." And they say, "We hear and we obey. [We seek] Your forgiveness, our Lord, and to You is the [final] destination." Sahih International Allah does not charge a soul except [with that within] its capacity. It will have [the consequence of] what [good] it has gained, and it will bear [the consequence of] what [evil] it has earned. "Our Lord, do not impose blame upon us if we have forgotten or erred. Our Lord, and lay not upon us a burden like that which You laid upon those before us. Our Lord, and burden us not with that which we have no ability to bear. And pardon us; and forgive us; and have mercy upon us. You are our protector, so give us victory over the disbelieving people."